Disclaimer: This is a sponsored post. While YBC was compensated for the post, we only work with companies whose missions we support and whose products we love. We try to focus our partnerships on small businesses, because we really believe in shopping small, and we thank you in advance for supporting the companies that support YBC. Years ago, I used to be a Bikram fiend. I couldn't get enough, despite pretty much all but hating it while I was actually practicing. It was miserably hot but that feeling afterward? That was a natural high I rode for the rest of the day! I felt like I had just climbed Mount Everest and there was nothing I couldn't do! Row a tiny little boat around the world? Done. Run a marathon in my bare feet on the hottest day of the year? Yes. I can do anything, I wanted to shout after class. To this day, I still love that post-Bikram high, but it's not my go-to anymore. This is mostly due to the fact that I don't have a studio close by, and because I'm really happy with my current schedule - working out and traditional yin and power yoga to complement. Today we're offering up some awesome goods to make your hot yoga class a success! 1. Osmia Organics Recovery soak - This stuff is amazing. It's made with hand harvested sea salt, epsom salt, and a lavender essential oil blend. My baths with this recovery soak feel so luxurious and my skin feels so smooth afterwards. $29. Discount Code: YBCFLOW15 for 15% off the Recovery Salt bath. Valid 10.19-11.19. 5. Earth Easy Scrubba Wash Bag This is for my people on the go - it's basically a portable washing machine and I would've LOVED to have this as a college student who just wanted to quickly wash one or two things without having to do (and pay for) and entire load of laundry! Discount Code: Scrubba10 valid through 12/1/15. 6. Biokleen Sports Laundry Liquid and the Natural Fabric Refresher. Sweaty yoga clothes are gross and sometimes it's hard to get the sweat out of the clothes - especially if you forget to throw them in the wash right away (believe me, I've been there). That's why I like biokleen sports laundry liquid - it's all natural and smells like delicious, calming lavender, but it actually works. The other item I love from them is their natural fabric refresher. It's like fabreeze but all natural. 7. Flaska Glass Water Bottle I love a good reusable water bottle, and when it's made out of glass I'm psyched because then we don't have to worry about the hazards of drinking out of plastics. This is a great bottle because it also comes with a little neoprene protective sleeve jujutsu in case. Discount Code: Yoga for 20% off any purchase valid until December 31st 2015. 9. Fit Lifestyle Co. Mat and Yoga Towel. This is a super innovative product and I've never seen anything like it. It's a yoga mat but the top is like a yoga towel to help prevent you from slipping while in a heated class. The vibrant palm tree makes it that much more enjoyable to use. Discount Code: 10offPWs for 10% off yoga mats with design Palm or Waterfall. This giveaway is open to people in the USA. 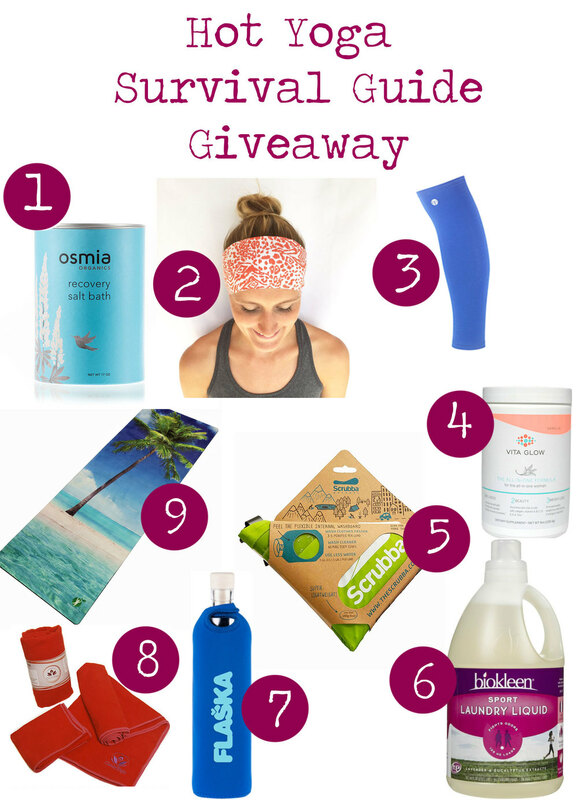 To enter the giveaway, let's talk about hot yoga classes. Do you love them? Hate them? Never tried? Funniest hot yoga class memory? Once you leave your comment below, click in the rafflecopter widget below to let us know you entered. Can't wait to hear what you think of hot yoga classes! A winner will be announced here next Monday. If you have an email address you use for promotional content, feel free to use that email, as the sponsors will receive your email data for future occasional emails.